Nothing says spring like asparagus! 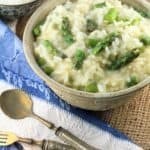 In Lemony Asparagus Risotto, asparagus is the star of the show and the flavors are elevated with the freshness of lemons. 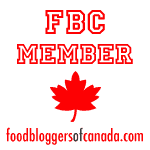 This post was first published in April 2015 and reposted March 27, 2019. It’s spring at last! Nothing says spring more than fresh asparagus. And there’s no doubt we’ve been impatiently waiting for spring. This early on in the season, the asparagus we’re enjoying here in Quebec is definitely imported. But soon these tender stalks will begin to emerge here at home! At our house, we enjoy simply steaming asparagus and giving it a quick sauté in olive oil. 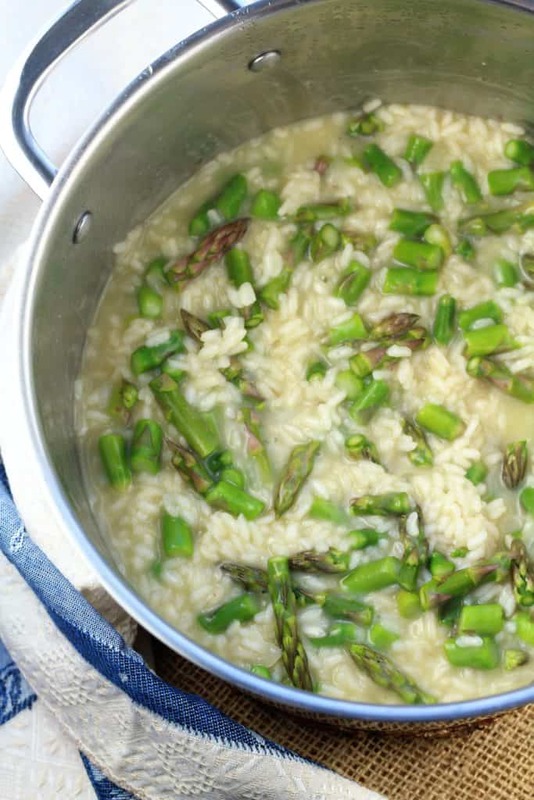 However, one of my favorite ways to showcase fresh asparagus is in this Lemony Asparagus Risotto. 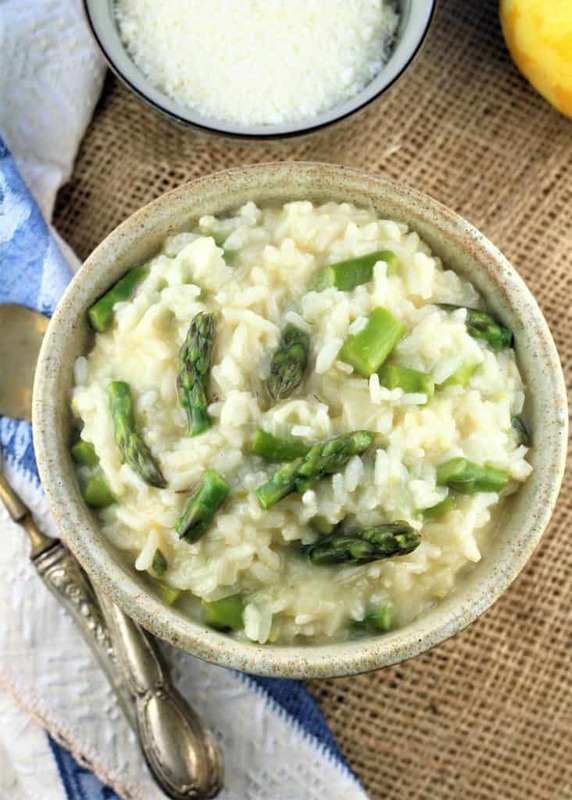 A simple creamy risotto with asparagus is delicious with the addition of lemon juice and fresh grated lemon rind. The lemon freshens up the whole dish and gives a bright new flavor to your usual risotto. Risotto is northern Italian in origin but nonetheless a dish I grew up eating. My mother made Milanese style risotto flavored with saffron and she always added mushrooms. 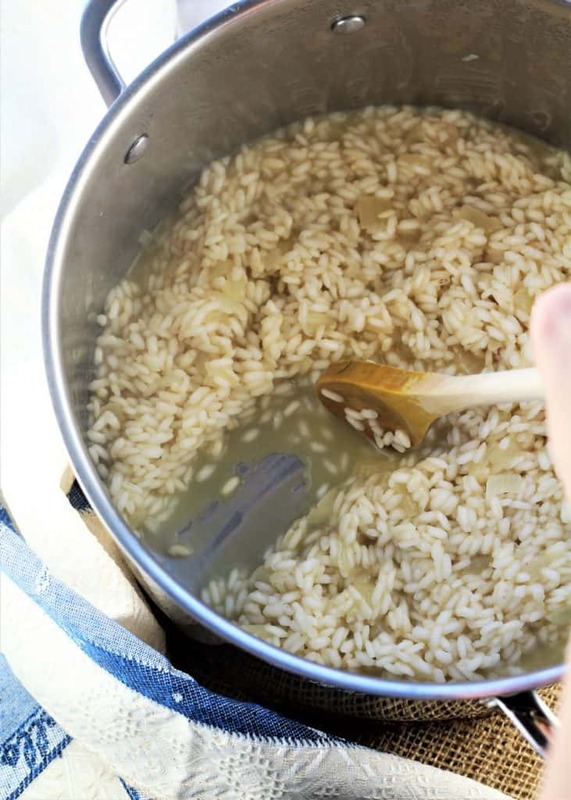 Risotto is one of those great dishes you can make with practically anything you have in the fridge, as long as you have arborio rice and broth on hand. And about 25 minutes of stirring time, of course. Try experimenting with different ingredients including peas, squash, radicchio, spinach, sausage and seafood, just to name a few. The possibilities are endless. One of my new favorites is Fennel and Leek Risotto. A must try combination! Rinse the asparagus well, especially the tips which may contain fine grit. Trim off the woodsy ends. Cut into roughly 1 inch pieces. Set aside. All risottos begin with a pot of simmering broth. In this recipe I used chicken broth. In a large dutch oven, sauté a diced onion in olive oil. When it’s translucent, stir in the arborio rice and cook, stirring, for about 2 minutes. The idea here is to coat the rice in the oil. Add white wine and cook for 2 minutes longer, until it has evaporated. Begin adding hot chicken broth, one ladle full at a time, and stir on medium heat until the broth is completely absorbed. The key to knowing when it’s time to add more broth is to drag your wooden spoon across the bottom of the pot. If you see the bottom of the pot, as shown, it’s time to add more broth. After about ten minutes of cooking and adding broth, stir in the asparagus stems. Continue adding broth and after 5 minutes more, stir in the asparagus tips. Continue adding broth and stirring until it is absorbed and the rice is tender but still has some bite to it, about 5 minutes longer. Add salt, if needed. Remove from heat and stir in butter, lemon zest, lemon juice and Parmigiano cheese. Serve hot with extra Parmigiano at the table. The key to cooking risotto is to make sure your broth is hot. Keep your pan of broth simmering on the stove top next to your risotto. For a vegetarian version, simply swap out vegetable broth for chicken broth. The broth must be added a bit at a time as it is absorbed by the rice. A good trick I learned is to drag a wooden spoon across the bottom of the pan. If you see the bottom of your pan as you drag the spoon, you know it’s time to add more broth. After about 25 minutes of cooking, taste your rice to see if it’s ready. It should be tender but should have some bite to it. If you run out of broth and your rice is not completely cooked, just add some water but make sure to heat it first. Let me know how much you like this Lemony Asparagus Risotto by tagging me with your photos with #mangiabedda or @mangiabedda on Facebook and Instagram. Don’t forget to pin the recipe for later. Buon appetito! Nothing says spring like asparagus! 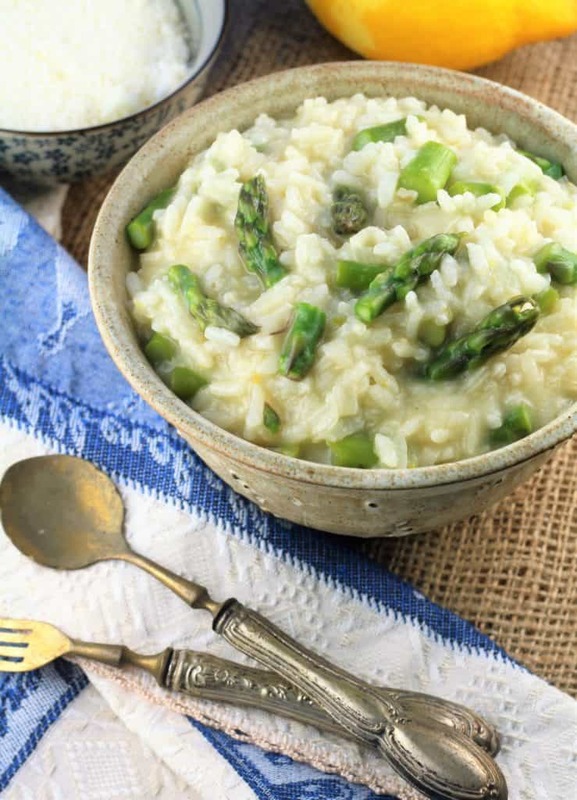 Asparagus risotto is kicked up with a touch of lemon to give it extra freshness. Place chicken broth in a small sauce pan and bring to a simmer. Trim woody ends off asparagus and rinse well. 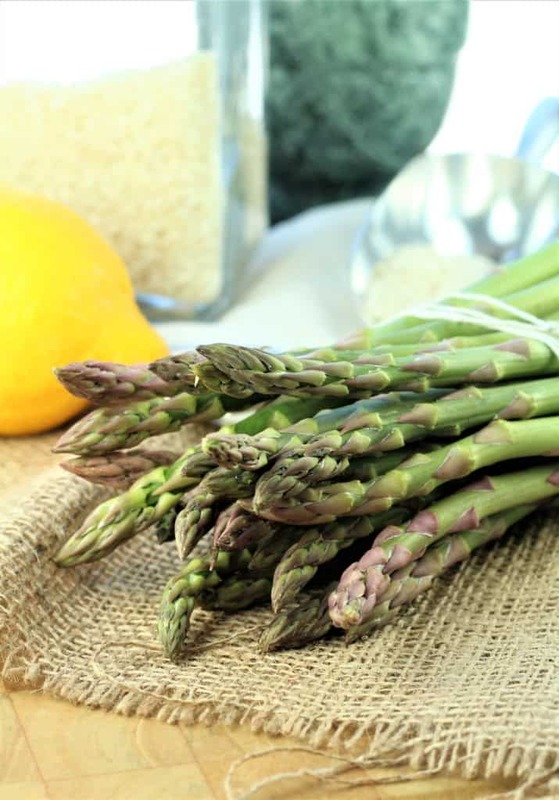 Chop asparagus in 1 inch pieces, separating the stems from the tips and set aside. In a large dutch oven, heat oil on medium heat and sauté onion until translucent. Add rice and stir until it is coated with the oil and lightly toasted, about 2 minutes. Pour in the wine and cook until it has evaporated. 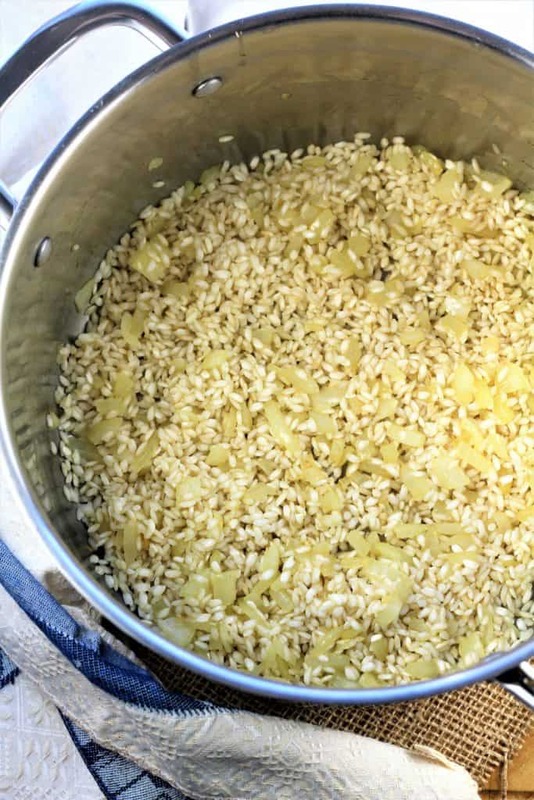 Begin adding hot broth to your rice mixture with a ladle, one scoop at a time, and stir. When the broth has been absorbed, continue adding broth, one ladle full at a time. After about ten minutes of cooking, add the chopped asparagus stems. Continue adding broth as before. After five more minutes, add asparagus tips to the rice mixture. Continue cooking until the rice is tender but still has some bite to it. Total cooking time may vary from 20-25 minutes. Add salt to taste. The key to cooking risotto is to make sure your broth is hot. Keep your pot of broth simmering on the stove top next to your risotto pot. The broth must be added a bit at a time and more is added when the broth has been absorbed by the rice. A good trick I learned is to drag a wooden spoon across the bottom of the pot. If you leave a space as you drag the spoon, you know it's time to add more broth. After about 20 minutes of cooking, taste your rice to see if it's almost ready. It should be tender but with some bite to it. If you have run out of broth and your rice is not completely cooked, just add some water but make sure to heat it first.